W. H. Auden's last major work. 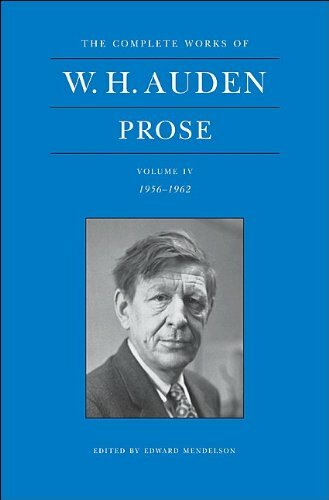 This fourth volume of W. H. Auden's prose, edited and introduced by Edward Mendelson with customary mastery, covers a mere six years of the poet's life. But they were eventful years for him, personally and intellectually. In 1956 he was named Professor of Poetry at his alma mater, the University of Oxford; in 1957 he won the Feltrinelli Prize for Literature, which allowed him for the first time in his life to buy his own house, a cottage in Austria; and in 1962 he published a large, heterogenous, yet comprehensive account of his key critical ideas, The Dyer's Hand. Though at the end of this period Auden was only fifty-five, The Dyer's Hand would be the last truly major work of his career. Perhaps more troubling to Auden, many English people had never really forgiven him for leaving the country for America in 1939, when war was about to break out, and not returning once war did break out. Indeed, a number of the electors of the Professor of Poetry (all holders of the M.A. from Oxford) declined to vote for Auden for this very reason.